of the lake, the water was more brackish. Several cities used the lake to dump raw sewage. It was felt that making an additional opening to the sea would help “flush” the lake and to provide access for anglers and sport fishing. The inlet was opened in 1927, and is a popular recreational spot for picnics and fishing. The original article from March 17, 1927, announcing the inlet opening, from the Palm Beach Post. At 11:18 o’clock last night the South Lake Worth Inlet at Boynton became a reality. For at this hour waters from the Atlantic ocean glided in through the tiny cut, shoveled in the sand, and mingled with the waters of Lake Worth, for the first time at this point, filling the channel cut by a huge clam shell dredge. Dozens of spectators leaned from the bridge, which tops the project, and watched the operations by the glare of large search lights, while others tramped through the sand below to stand on the point to observe the laborers as they shoveled the opening wedge through which the ocean flowed. Although about two weeks work yet remains for dredging the sand and cutting through part of the rock in the channel, last night’s task marked the official opening of the South Lake Worth inlet and the real termination of the project extending over a period of many years. The South Lake Worth inlet, connecting the Atlantic ocean and Lake Worth, at a point just north of Boynton and the head of the lake, when completed will be available for pleasure craft, as well as being a vehicle for drainage. A depth of five feet at low tide will be increased to seven at high tide with a space of 154 feet between the two front jetties, and a 32 foot overhead clearance under the bridge. Conceived in 1923, the project was almost one year in assuming definitive shape at the end of which time plans had been drawn, estimates made, the inlet district created and the project financed. The district extends from Southern Boulevard in West Palm Beach to a point one mile south of Boynton. Riddle Brothers, engineers, were engaged to have charge of the entire projects, and last night both Karl and Kenyon Riddle of the firm, stood on the sands and watched the culmination of the $225,000 project, together with many of the town officials. The concrete bridge, which has no draw, was completed August 1, 1924. 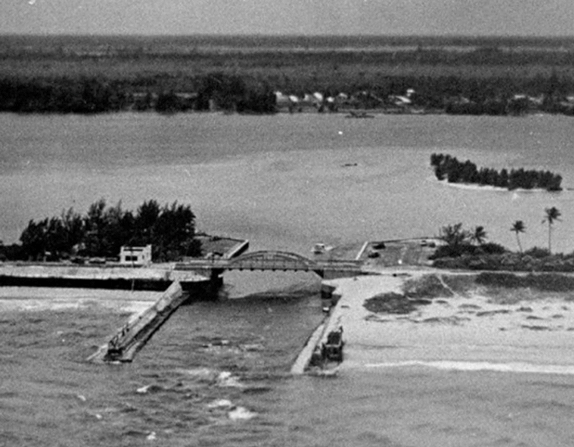 Work started on the inlet proper in September, 1923, first on the solid concrete jetties, both of which withstood both hurricanes last summer without damage. The jetties, according to the engineering are of a peculiar construction, unique along the coast. A suction dredge has been at work on the channel for some time and on Tuesday of this week the clam shell dredge began operations in a 21 hour-a-day schedule. It is expected that with the opening wedge cut, much of the sand will wash out to sea during high tides.